1. What is your policy regarding Concealed Weapons in your store? 1). Open Carry is NOT allowed on the premises at all. 2). It is DANGEROUS to draw a firearm in the store. 3). Your firearm MUST remain concealed until you are on the range, at which time the posted range rules apply. 4). Firearms brought in for service, repair, or to fit a holster, MUST be unloaded and in a case. 5). These policies apply to ALL of our patrons- Law Enforcement, Security, and CPL Holders. 2. What are your Firearm Range Rules? The following rules have been implemented for YOUR OWN safety as well as the safety of our other guests. Please read them carefully! 1). Shooting firearms can be dangerous, shoot at your own risk. 2). Management WILL NOT assume responsibility for mishandling of any firearms or the unsafe handling of your own equipment or that of Double Action. 3). ALWAYS point firearm in a SAFE direction. 4). ALWAYS treat all firearms as if they are LOADED. 5). Keep your finger OFF of the trigger until your sights are ON the target. 6). Loaded firearms are NEVER permitted outside of the range. 7). RAPID FIRING IS NOT PERMITTED! A one-second interval between each shot is mandatory - this includes double taps. 9). Long Guns MUST BE loaded in the booth only with the barrel pointed downrange for safety. 10). On hearing the command "CEASE FIRE" immediately STOP firing and wait for the next command. 11). NO gun cleaning or barrel break-in is allowed on the ranges or premises at any time. 13). Hearing and eye protection MUST BE worn on the range at ALL times. 14). Horseplay on the range WILL NOT BE tolerated, and will be cause for IMMEDIATE EJECTION from the premises WITHOUT refund of fees, and shooter will be liable for any damage that may be incurred. 15). Eating, drinking or smoking IS NOT permitted on the range. 16). No more than ONE shooter in a booth at any time. 17). We reserve the right to refuse admittance to anyone to the range at any time. 18). The above list of rules is by way of illustration and shall not be deemed to exclude the range officer's right to eject anyone from the range for any other reasons. 3. Can I buy a firearm somewhere else and have it shipped to you? Yes you can. It's called a 'Transfer'. Click Here for more info. Please call us for details PRIOR to making your purchase. 4. 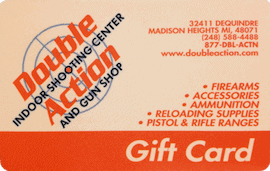 Do you offer Gift Certificates or Gift Cards? Yes we do! Click Here for more info. 5. Do you offer firearm lessons? Click Here for our hours of operation and a map to our location. We're located in Madison Heights, Michigan. Click Here for a map to our store and for our hours of operation. 8. Can I Rent a Firearm if I'm not a Michigan resident or I live outside of the United States? Yes you can. To rent a handgun you must be 21 years old or older. To rent a long gun, you must be 18 years old or older. We will need to see your state drivers license, passport, or some other official document which lists your birthday.